The Episcopal Church of the Holy Comforter has been in Southeast Atlanta for over 100 years. By the 1980s, Holy Comforter was firmly situated in a neighborhood that had many personal care homes for persons with developmental disabilities and mental illnesses. So the people of Holy Comforter did what came naturally to them: they simply reached out to their neighbors and invited them into the church. This is unique: Holy Comforter does not simply run a program to help persons with mental disabilities; rather these people, so often alienated in society, are the church at Holy Comforter. People of all abilities are knit together by the love of Jesus Christ at Holy Comforter. Every Tuesday several people from our church go to Holy Comforter from 10:00 a.m. to Noon to organize, maintain and distribute clothes and much needed items to people of this community. So many things that we consider necessities and take for granted are desperately needed by those in need. Soap, shampoo, deodorant, tooth paste and toothbrushes, shoes, t-shirts, pants, underwear – are always helpful. If you have used but serviceable items that can be handed down, they can be put to good use by dropping them off at the St. Peter & St. Paul Outreach closet in the Holy Comforter Bin. Come join us to help–many hands make light work! And you will be a blessing to some very special people. For more information about the Holy Comforter Clothes Closet, contact Linda Koehler at lkoehler@comcast.net. 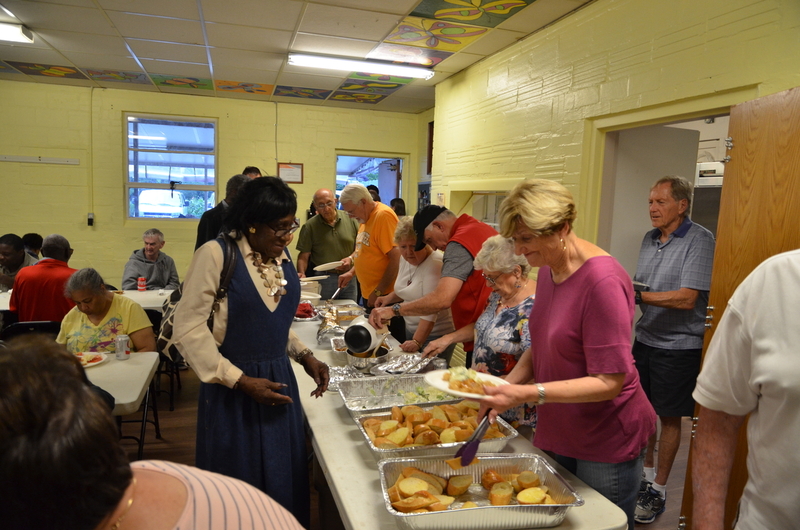 On the second Saturday of each Month, we gather at St. Peter & St. Paul and caravan/car-pool to Holy Comforter where we join them in a rousing song service for about an hour, then we serve and join them in a big meal, including carry-out of planned leftovers. We have been doing “SNL” since the spring of 2003 and in that time have gotten to know these people as children of Christ who crave fellowship and appreciate our friendship. We invite you to join us in this outreach ministry with the assurance that we are part of a community that cares and shares in ways that reflect the example of Jesus Christ. ​For more information, contact Rudy Lind at rudylind123@gmail.com. Every December, St. Peter & St. Paul hosts members and friends of Holy Comforter for dinner, singing, and a visit from Santa. The week before, we wrap packages for each of our guests that includes helpful supplies such as clothes and toiletries. You can help at the wrapping party, Food preparation, clean-up, and just getting to know our guests and helping them to feel welcome. For more information or to get involved in our Holy Comforter ministry, contact Rudy Lind at rudylind123@gmail.com.